We offer non surgical procedures, including dermal fillers, Botox, Juvederm, Voluma, Latisse, Restylane Silk, Belotero, Chemical Peels and CoolSculpting. 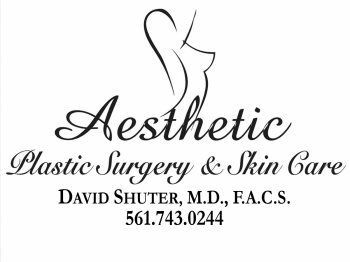 All injections are performed by Dr. Shuter. For your free cosmetic consultation and to see if you can benefit from Botox or Fillers, please call our office at (561)743-0244 and schedule your appointment today. We also have a full time licensed aesthetician on staff. Beth has extensive expertise on skin care products and medical peels. You can meet with Beth and discuss your current skin care regimen at no charge. Current special: receive a free peel with the purchase of $250 products for all new clients. Call today (561)743-0244 to schedule. What is a medical peel? A peel is a three step process which includes deep cleansing, application of a mild acid which gently exfoliates the micro-thin top layer of the skin and a gentle moisturizing mask to re-hudrate the skin. Environmental exposure and skin conditions can damage the skin, obscuring clarity, tone, color and texture. A peel can correct this damage. * A chemical peel can be done on the face, neck or hands. A chemical peel can reduce fine lines under the eyes and around the mouth, improve the appearance of mild scars, treat certain kinds of acne, reduce age spots and of course improve the look and feel of the skin. * Skin sags and severe wrinkles may need other kinds of cosmetic intervention such as laser resurfacing, facelift, blepharoplasty (eyelid lift) and/or filler. For more information or to schedule your peel, please call our office (561)743-0244.